There are always fascinating ideas getting passed around as Lego Ideas proposals, but this one flew straight to our attention. Creator AbFab1974 chose to depict the Peugeot 205 Turbo 16 Evolution 2 Group B rally car in its natural habitat: catching some air. The little 205 is the scary beast of a car that won the drivers’ and constructors’ championships for both 1985 and 1986 in the World Rally Championship. 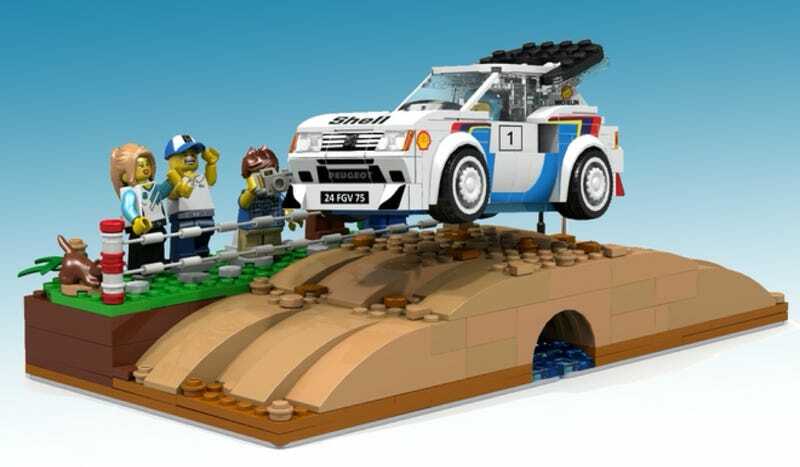 The creator envisions it joining the Speed Champions set of awesome Lego race cars, with stickers faithfully representing the car’s livery and sponsors as well as “realistic terrain” to fly over. We’re enamored with the shot of it mid-jump, though. At first, I mistook the fence posts for stands that would hold the car up in the air, but those are clearly behind the car. This would be so much better if you could prop the car up on little clear posts above the dirt below. Make it happen, Lego. As with all Lego Ideas, you can vote to make it happen here.